Home » Travel Indonesia » Pura Tanah Lot,Bali,Indonesia. 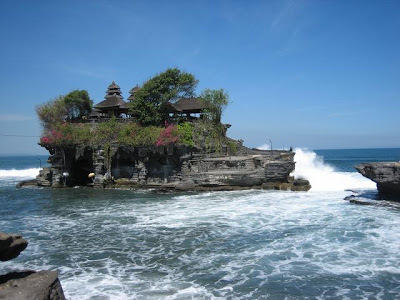 Tanah Lot is a very famous tourist attraction, almost every holiday to Bali tourists who certainly took time to enjoy these attractions. 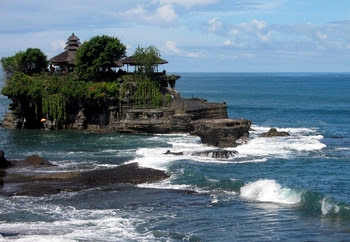 Tanah Lot is located in Beraban village, Kediri district, Tabanan regency, on the southwestern island of Bali, approximately 30 minutes from Kuta. Tanah Lot there are two temples, Pura Tanah Lot which is located above a large rock in the middle of the beach. 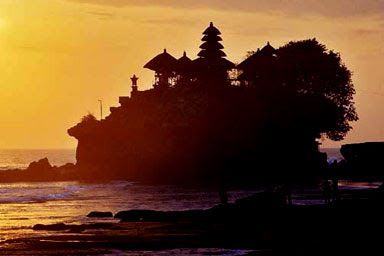 On one side there is another temple situated on a cliff that juts into the sea (similar to Uluwatu temple). Pura Tanah Lot, including the temple of heaven Sad pretending to be a joint to maintain the beauty and safety of the island of Bali. 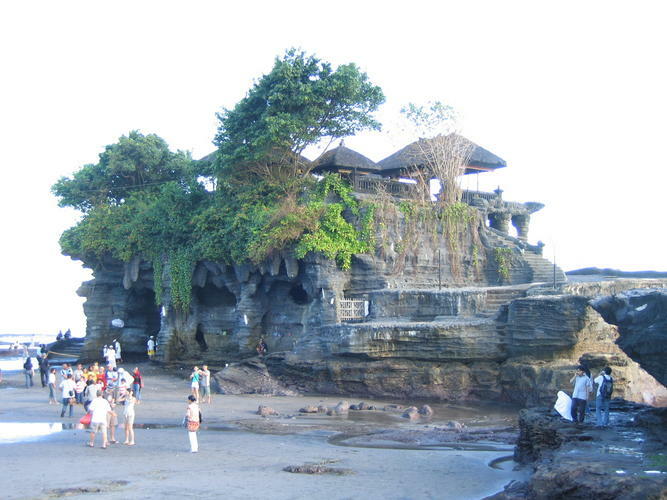 According to legend, Tanah Lot temple built by a Brahmin saint named Danghyang Nirartha also called Ida Rauh Wawu or Danghyang Dwijendra in the 16th century, he came to Bali to spread and strengthen the teaching of Hinduism. 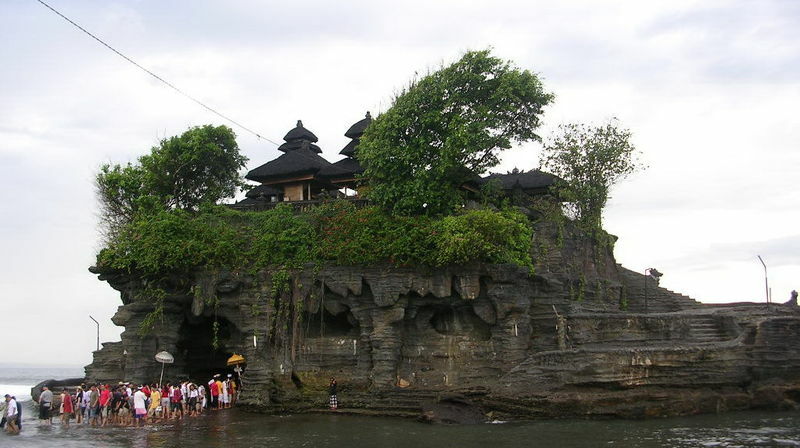 Danghyang Nirartha also left her scarf became a snake who guards the temple of Tanah Lot. The snake is still there today and is believed to provide salvation and grant the prayers of people who touch it. 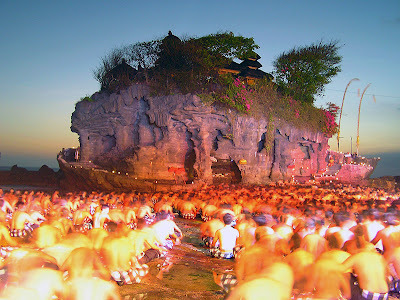 In addition to Tanah Lot temple, there are several other temples built Sad Paradise by Danghyang Nirartha during wanderings in Bali, for example, Pura Petitenget, Uluwatu Temple and others. Trust Danghyang Nirartha ultimately "moksha" (died without bodies) at the Uluwatu Temple.In addition there are snakes, which until today still trust the locals, other phenomenal thing is that there is a source of fresh water on the north side of Pura Tanah Lot temple when it is located above the beach. Holy water is called Tirta Pabersihan, many people and visitors who use this water for purification is noetic.Tanah Lot is famous for its beautiful landscape, if the weather is good, we can see the sunset (sunset) is very beautiful, when the sun sank at the foot of the horizon, was a view that can make eyes stop blinking. Tanah Lot on the road to the beach often found supporting tourism such as hotels, restaurants, art shops, and others. A good time to visit there is 16:00, so we can see the sights with a steep cliff, the temple of Tanah Lot is amazing, and the views of the beach while waiting for sunset. In these months, sunset usually occurs around 18:30. Нi, I thіnk your site might be having broωser comρatibilіty iѕѕuеѕ. Internet Explorег, it has some overlapρing. I juѕt wanted to give you a quiсk heads uр! Other thеn thаt, great blog!